Chickenpox is a highly contagious disease that once infected approximately 4 million people in the U.S. a year. "Chickenpox is an infection that's caused by a virus called the varicella virus," says Dr. Nipunie Rajapakse, a pediatric infectious diseases specialist at Mayo Clinic. "The symptoms of chickenpox usually involve itchy rash that looks like little blisters that can appear over the surface of the skin, fever, sometimes respiratory symptoms, runny nose, and cough associated, as well." Cases of chickenpox declined after the chickenpox vaccine became available in the U.S. in 1995, but it remains a concern. "The important thing to know about chickenpox is that even though it used to be a common childhood infection, there are very serious complications that can occur, including infections of the brain; infections of the lung; and secondary bacterial infections of the chickenpox spots, including cases of flesh-eating disease or necrotizing fasciitis, which were reported, as well," says Dr. Rajapakse. Watch: Dr. Nipune Rajapakse explains chickenpox. The virus can be spread through direct or close contact with someone who has chickenpox and through the airborne route. 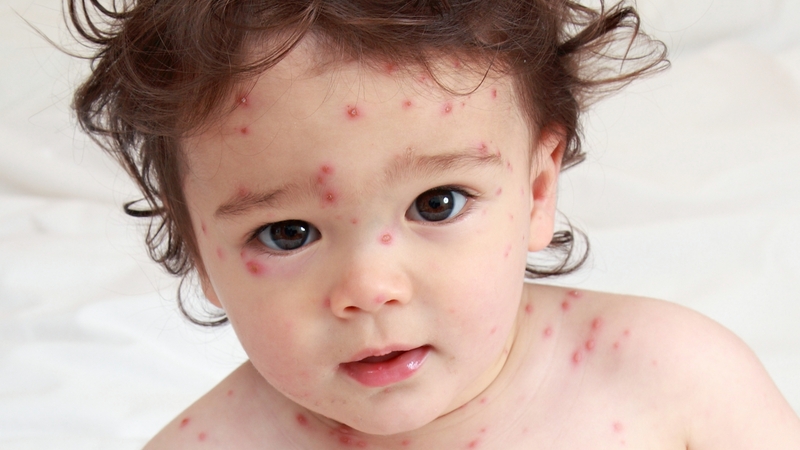 Cases of chickenpox continue to develop in areas where children are unvaccinated. Dr. Rajapakse says chickenpox also can be picked up when people travel to areas where vaccine is not routine. "Chickenpox is definitely still present in the U.S., and it's possible to get exposed and infected." The best preventive is vaccination. "The chickenpox vaccine is available as a combined vaccine with measles, mumps, rubella. There's a measles, mumps, rubella, varicella and chickenpox vaccine. There's a free-standing chickenpox vaccine, as well," says Dr. Rajapakse. The Centers for Disease Control and Prevention recommends that children receive the first dose of the varicella vaccine at 12–15 months old and a second dose at 4–6 years old. Chickenpox may be a thought of as a childhood disease, but it also has implications for adults. "Chickenpox and shingles are caused by the same virus. When you get infected with it the first time, you develop the classic chickenpox illness with the diffuse rash. Once you are infected with chickenpox virus, it stays in your body in a latent or a sleeping state, which can then wake up or reactivate later on in life. When it does that, that's what we call shingles," says Dr. Rajapakse. A new shingles vaccine is now available. The Centers for Disease Control and Prevention recommends the vaccine for all adults 50 and above.